An enhanced flu jab for elderly people will save hundred of lives this winter, according to Public Health England. Flu is far more dangerous in old age. The effectiveness of flu jabs notoriously declines as people get older and was effective in just one in 10 over-65s last winter. The enhanced vaccine that will be given this year contains extra ingredients designed to help aged immune systems develop a stronger defence against flu. It is hoped the "adjuvanted vaccine" will help ease pressures on the health service. Prof Paul Cosford, from Public Health England, told the BBC: "This looks like it is going to be is a significant improvement and quite a step in our battle against flu each winter." The vaccine will also be offered to the over-65s in Wales and Northern Ireland as well as the over-75s in Scotland. The over-65s vaccine will protect against three strains of flu, but people under 65, in the so-called at-risk groups, will be offered a vaccine that protects against four types of flu. At-risk groups include pregnant women and those with long-term health conditions. Meanwhile, the childhood vaccination programme will be expanded so children from age two up to Year 5 in primary school are offered a flu nasal spray. Children are seen as flu "super-spreaders" - in part due to worse hygiene - so the childhood programme is designed to protect both children and anyone they come into contact with. In total, 24 million people in England will be offered the flu vaccine - 3 million more than last winter. But a major sticking point for health officials remains the roughly one-in-three NHS staff who do not get vaccinated. 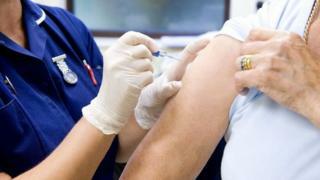 Prof Cosford said staff had a "professional duty" to be vaccinated to protect their patients. Prof Jane Cummings, chief nurse for England, said up to half of flu cases had no symptoms so she expected staff to be vaccinated. She said: "Faced with the worst flu season in a decade, NHS staff last winter did a remarkable job providing care for patients. "This year, the public will be better protected from flu than ever before, with at-risk groups being offered the most effective vaccine available and every member of NHS staff expected to get their jab." Chief medical officer, Prof Dame Sally Davies said: "Getting the flu vaccine is the single best way to protect yourself against this potentially fatal illness, and this year, the NHS is offering it to 24 million people across the country. "In addition to this - a newly available vaccine that is more effective will be offered to over-65s. This could prevent hundreds of deaths and save thousands of GP and hospital hours - I strongly encourage everyone in vulnerable groups to get the life-saving vaccine as we head into winter."